There are some weeks when its just good to be alive. Full of energy and good things happening. This is one of those weeks for Josh. A few weeks ago we shared that Josh’s story about getting physical and working with a personal trainer was going to be highlighted in The Times. The reporter interviewed us and the photographer took pictures. Then Tom Sistak, the photographer, decided he wanted to put together a slideshow of Josh. So he was given some more time to pull that together. It was such a fun experience to share Josh’s story. On April 3rd, of this week, Josh’s story appeared. It can be seen by going to www.mywebtimes.com and clicking on the story titled Moving On. The slideshow is also available and it’s titled Movin On. 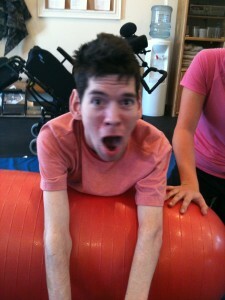 I took Josh to Riverside yesterday to work out with Abbey. 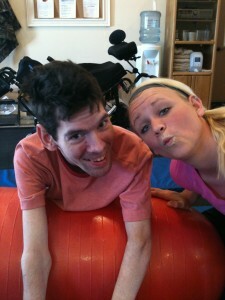 While she was stretching him, the phone rang and it was from our local Easter Seals. They had seen Josh’s article and wanted to know if he would share his story at their Telethon on April 14th. Easter Seals is near and dear to our hearts because of the early help Josh received from them, so we said ‘yes’. Now to this week’s training. 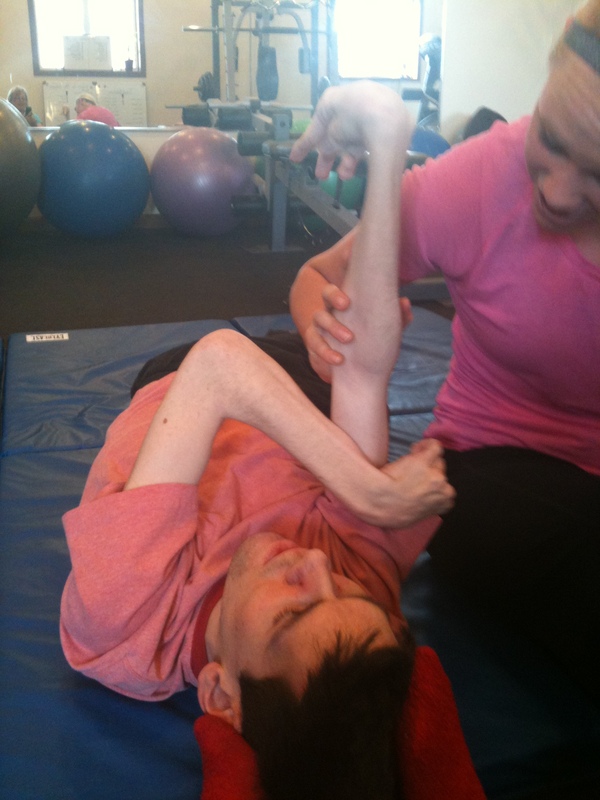 During the stretching portion of the workout, Abbey usually ends by working with Josh’s arms. He’s getting very good at straightening the right arm. We still need to work on wrist and hands but his arms is nice and loose, and the reflexes continue to decrease. But, something interesting is starting to develop. When Abbey helps him straighten his right arm, Josh is beginning to move his left arm upward to meet his right arm. In photo #1 we see Josh with right arm extended and left arm in full reflex. It almost seems like when he focuses on Abbey and his right arm, and forgets about his left arm, it comes out of the reflex. In picture #2 you can see him get his shoulder and upper arm in the correct position. What excites me is when he’s not thinking about it, it happens very fast and smooth, no effort at all. Then in photo#3 he actively starts to work to get his left hand raised. We can see him wanting to touch both hands together. He wants to extend his left arm up straight and to do it by his own effort. We see his elbow unlocking as he continues to try. He’s not there yet but his brain knows what he wants to do. We just need to keep working on building new neural pathways and eliminate the reflex patterns. As long as Josh is willing to try, we’re willing to help. The ball continues to be Josh’s favorite part of the exercise. He loves being on his stomach. He did his regular head turns. Left, right, and center. Abbey was clowning with him and here’s a shot I got with them mugging for the camera. The clowning tickled Josh and relaxed him and when we asked for midline we got this. Last week his left arm was still cranked in a reflex pattern. This week, both arms are extended and looking good. Josh did one more thing this week that I want to comment on. Last week I saw him do something new. Instead of just turning his head, left, right and center he also looked behind him. What excites me about this move is to do it, he has to use his whole upper body. It’s not just turning his head, he’s turning the entire torso. 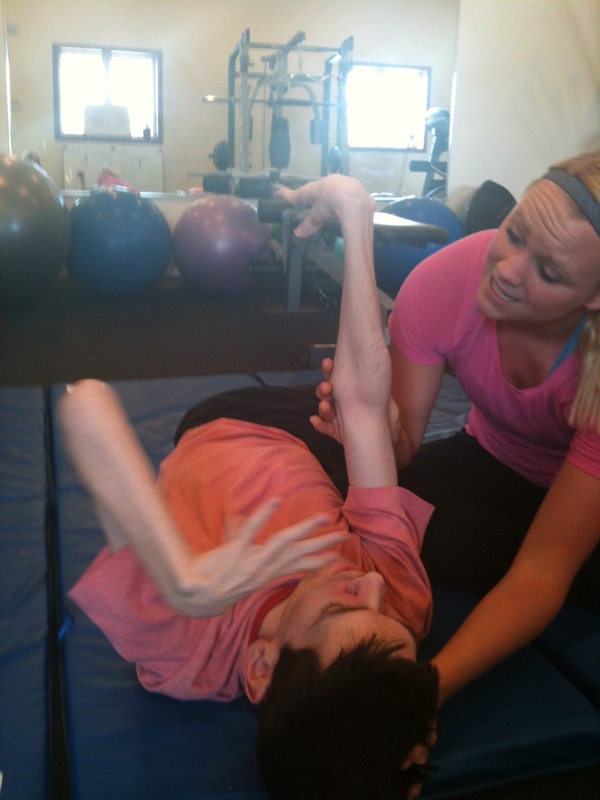 This means he’s developing enough muscles on his rib cage and hips to be usable. I can’t even describe how excited this makes me. It’s so difficult for Josh to move when he’s strapped in a wheelchair that a lot of these muscle groups don’t get used at all. For him to have come this far in only 9 weeks simply astounds me. It also energizes me. When I see how fast muscles can respond to appropriate and adequate exercise I can’t do less than he does. His energy during these workouts puts me to shame. Here Josh is looking behind him. We added a game this week. When Josh was doing this exercise of looking behind him, I would run from one side to the other and he had to follow me. He was whipping that head around to get in position faster than I could run. We had a lot of fun and with him focusing on the game, he totally forgot about his body. I really do need to learn to set up a video camera to show the movement. He did some amazing weight bearing on his legs this week but I have to help with that and can’t take pictures. I told Abbey that I think its time for Josh and me to hire someone, preferably a male, to help out during the sessions. Josh is gaining weight and his muscle mass is growing at such a fast rate that I am getting overwhelmed. I’m shorter than he is, quite a bit older, and not in near good enough shape to be lifting and carrying Josh. I think we’re fast approaching the time when we need to get help during the workout sessions. Ideally, I’d like to get someone who is training to be either a physical therapist, or something to do with disabilities or the health field. It’s exciting to realize that we’ve gotten to this point in less than three months.